Materials consist of 11 cassette tapes containing interviews, project field report and final article, photo/video logs, release forms, photograph prints, check list, and event schedules. Digital materials consist of project documents in PDF and DOC formats, 13 interview recordings in WMA, 81 JPEGs, and 6 videos in WMV, AVI, and MOV formats. "Baton Rouge and New Orleans are the two major cities in south Louisiana where Chinese folk dancers practice and perform on a regular basis for traditional Chinese holiday celebrations and international cultural events. Three well-organized groups are the Chinese Sunshine Dance Group in Baton Rouge, the dancers of Chinese Friendship Association in Baton Rouge, and the dancers of the Academy of Chinese Studies in New Orleans." Guiyuan Wang (王桂园). 2009. 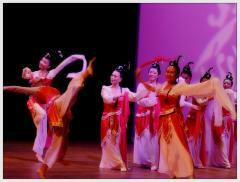 “Balance of Grace and Strength: Chinese Folk Dancing in South Louisiana.” Louisiana Folklife Program. http://www.louisianafolklife.org/LT/Articles_Essays/chinesedance.html. XXXV. New Populations - Subseries 2. Chinese Folk Dancing in South La.